For 2019 Kawasaki gives the 636 several upgrades in the form of goodies, styling, and some boring (but important to Euro customers) regulatory engine tweaks. Highlights are a standard quick shifter and new LED lights complimenting updating fairings. Kawasaki is no stranger to leading the way in performance and handling in the middleweight motorcycle category, with the Ninja ZX-6R continually winning awards and championships throughout the years. For 2019, Kawasaki has raised the bar yet again with the new Ninja® ZX™-6R sportbike. The latest “636” has a potent, 636cc liquid cooled 4-stroke in-line four-cylinder engine and advanced rider support features. The improved engine performance and components create a more versatile motorcycle for good times everywhere. The Ninja ZX-6R “636” utilizes race proven engine and chassis performance that has been optimized for the street; it offers the opportunities for exhilarating experiences in a wide range of riding situations. While its lineage gives it a high potential for track-riding fun, its street-riding focus makes it the middleweight motorcycle of choice for a day out on the winding roads. Developed to suit a wide range of riders, the Ninja ZX-6R “636” sportbike provides riders a platform that allows for plenty of excitement. The Ninja ZX-6R features optimized engine performance across the entire RPM range, idealized suspension components and design, along with increased advanced rider support technology. Complementing the increased performance and handling features is all-new, unique Ninja® styling, which signals the next step in the evolution of Ninja design and development. The Ninja ZX-6R is packed with premium class leading components and advanced technology, such as the Kawasaki Quick Shifter (KQS) to speed upshifts, twin LED headlights and taillights, and new Bridgestone BATTLAX HYPERSPORT S22 tires. 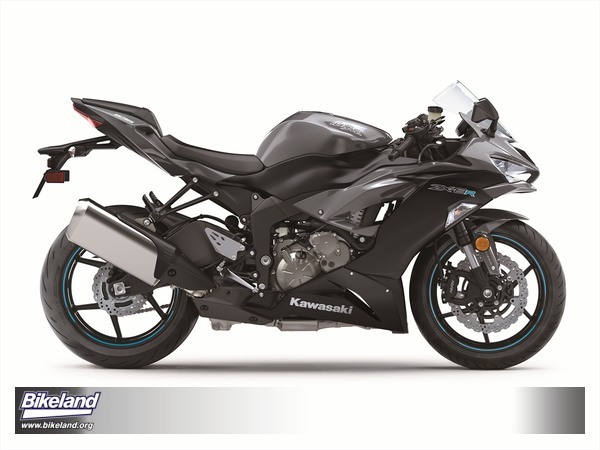 The Ninja ZX-6R features an efficient and powerful 636cc liquid-cooled in-line four-cylinder DOHC four-stroke engine. The additional 37cc over typical 599cc sport bikes is thanks to the 67.0 x 45.1 mm bore and stroke. New engine updates for 2019 enable the engine emissions to pass Euro4 regulation standards, without sacrificing the exciting performance that sport riders enjoy both on track, and on the roads. To meet the Euro4 emissions regulations standards without compromising the engine’s performance, ultra-fine atomizing injectors were utilized. They operate by injecting a droplet size of less than 60 microns to ensure efficient air-fuel mixing contributing to combustion efficiency. Precise settings contribute to a reduction in engine emissions, while ensuring that power and torque feeling are improved for riders who have come to know and love the Ninja ZX-6R power plant. Feeding the Ninja ZX-6R “636” power plant is a large-volume 5.09-liter air box, which helps to create peak power and smooth power delivery. The intake funnel design contributes to powerful low-mid range focused engine performance. The intake funnels have two different shapes with funnels one and four being shorter, while funnels two and three are taller. This design helps deliver the optimized power feeling. In order to protect the heart of the power plant, the piston skirts feature a molybdenum coating, which reduces friction. To maximize engine performance and reduce pumping loss, the engine features connecting passages between the each of the cylinders. 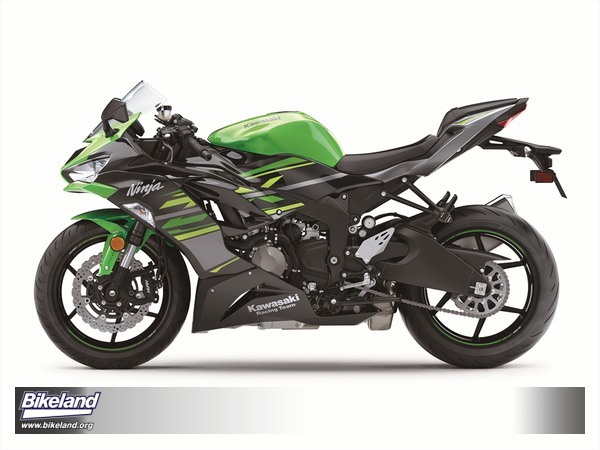 The Ninja ZX-6R “636” exhaust design ensures optimal engine performance. All four-header pipes are connected using joint pipes, which contribute to the low-mid range torque. An exhaust pre-chamber helps minimize silencer volume, contributing to mass centralization while the silencer’s triangular cross-section enables the requisite volume while ensuring a high lean angle and a compact image. The Ninja ZX-6R uses a cassette style transmission, which makes it easy to change gear ratios quickly, reducing necessary set-up time for track days. It also has an all-new shorter final gear ratio (15/43) which further emphasises the engine’s strong low-end; meaning it is well suited to have more fun on the street and on winding roads. New for 2019 is the Kawasaki Quick Shifter (KQS). clutch hub and operating plate apart, which relieves pressure on the clutch plates to reduce back-torque and help prevent the rear tire from hopping and skidding. 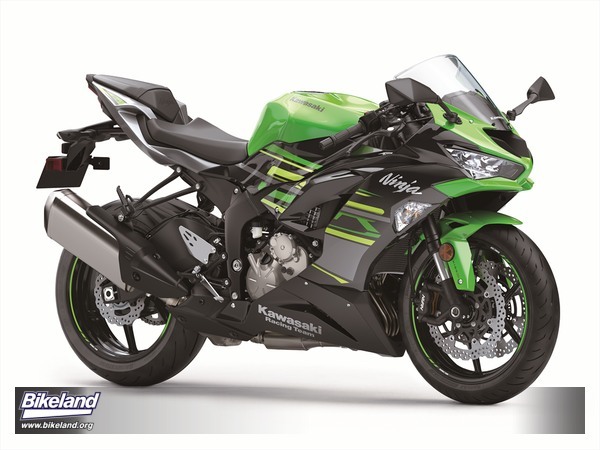 The Ninja ZX-6R sportbike features a pressed-aluminium perimeter frame design. The two-piece sub‑frame is made from aluminium die-cast pieces, consisting of a front and rear section. This layout enables a very precise, lightweight construction. It is also very narrow, allowing the rear of the bike to be very compact and slim. The base frame components offer a superb balance of flickable handling, mid-corner composure with the ability to change lines on command, coupled with excellent chassis feedback. Complementing the chassis design, the Ninja ZX-6R “636” is equipped with the Showa SFF-BP (Separate Function Fork – Big Piston) fork. Combining the concepts of Showa SFF and BPF, this advanced fork offers both racetrack performance and everyday usability. The Showa SFF-BP offers smooth action at the beginning of the stroke that contributes to excellent composure under braking. The large-diameter damping piston is much larger than what is found in a cartridge-type fork of the same size. The result is greater control as the fork begins to compress and a very calm attitude change as vehicle weight shifts forward when reducing speed, offering greater chassis stability on corner entry. The fork settings are designed to handle winding roads as well as delivering a high level of performance for the track, while also accommodating highway and city riding. SFF-BP offers easy adjustability. All the adjusters are located at the top of the fork caps: preload on the left, compression and rebound damping on the right. Each component only needs to be adjusted once. The Showa rear shock and suspension design contribute to rear ride comfort, offering a more plush feeling when riding in town or on the highway. The shock offers riders the ability to adjust preload, rebound damping and compression damping. The Ninja ZX-6R “636” comes equipped stock with the BATTLAX HYPERSPORT S22 tires. The BATTALAX tire contributes to lighter handling, which offers superior grip in a variety of conditions, that translates to greater rider confidence and enjoyment. The front wheel is equipped with a 120/70ZR17M/C (58W) tire; the rear wheel is equipped with a 180/55ZR17M/C (73W) tire. Handling the stopping duties upfront for the Ninja ZX-6R “636” motorcycle is a pair of powerful, highly rigid, radial-mount opposed four piston monobloc calipers, which grip a pair of large-diameter semi-floating 310 mm stainless-steel petal discs, offering superb control and a firm feel at the lever and contribute to strong braking. In the rear, the radial-pump master cylinder ensures excellent touch and offers superb control. The radial-pump master cylinder has been paired with a 220 mm petal disc and a lightweight rear brake caliper, the same found on the Ninja® ZX™-10R sportbike, which offers good anti-fade performance. New for 2019, on the Ninja ZX-6R is a highly reliable contactless-type quick shifter that allows for ultra quick, full power upshifts and seamless acceleration. The system detects that the shift lever has been actuated, and sends a signal to the ECU to cut ignition so that the next gear can be engaged for clutchless shifting. The Ninja ZX-6R “636” is equipped with Kawasaki TRaction Control (KTRC), which has three performance settings riders can choose from: Modes 1 and 2 prioritize maximum forward acceleration, while Mode 3 provides rider reassurance by facilitating smooth riding on low traction surfaces. The three modes of KTRC offer options for a wide variety of riding conditions. Riders also have the option to elect to turn the system off. 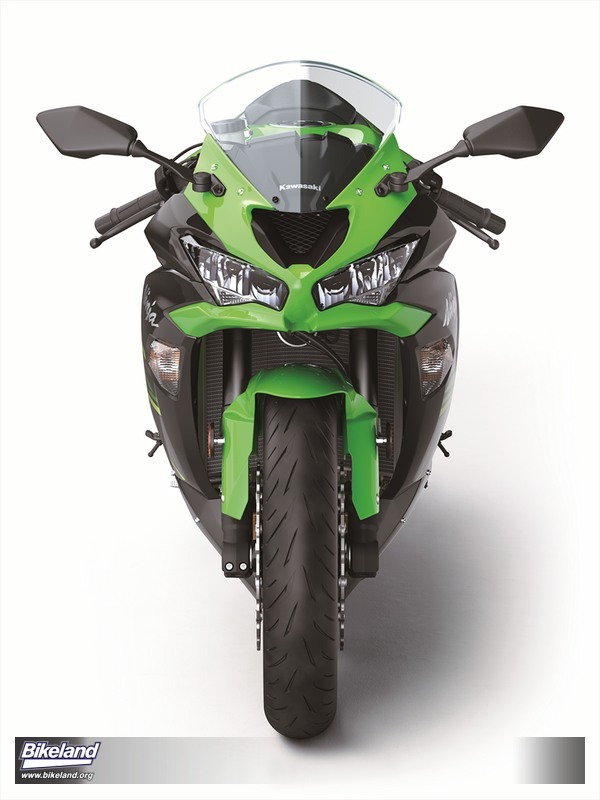 Kawasaki’s supersport-grade ABS is available on the Ninja ZX-6R motorcycle. KIBS is a multi-sensing system that collects data from a number of sources, including front and rear wheel speed sensors, monitors front caliper hydraulic pressure, along with information from the engine ECU to do its job. High-precision brake pressure control enables the system to avoid reduced brake performance due to excessive pressure drops, allows lever feel to be maintained when KIBS is active, and helps ensure smooth braking feel. Riders can set power delivery to suit conditions and/or preference, choosing from Full and Low. When combined with the KTRC and Power Mode options, riders have eight combinations from which to choose. Each system can be set independently to best suit rider preference, riding location and road conditions. All new styling gives the Ninja ZX-6R a fresh new image. Combining the powerful & attractive flowing design theme of the Ninja ZX-10R with sharp, edgy lines unique to this new model. The ZX6-R creates a strong Ninja family image while maintaining its own distinct appearance, inspired by its street-focused performance. The styling changes for the 2019 Ninja ZX6-R include a new front cowling and windscreen, LED headlamps, tail cowl, LED taillight, heel guard, as well as a new finishing process for the silencer. The all-new design of the front cowling and windscreen represent the next evolution of the iconic Ninja styling, while also offering a more open and confidence inspiring feeling from the cockpit. Each of the new LED headlamps features low and high beams as well as a position lamp. The new headlamps also offer significantly increased visibility and brightness to illuminate the way on night rides. Upswept lines of the new tail cowl were designed to give it a sharper appearance. Overlapping and interwoven sections are a key design element, contributing to the unique, attractive image of the Ninja ZX-6R. Drawing inspiration from its larger counterpart, the Ninja ZX-10R, an LED taillight was added to the new tail cowl, adding a sophisticated, high-grade touch to the rear of the bike. All-new heel guard design contributes to the bike’s dynamic stylish appearance. The silencer of the ZX6-R features a new finishing treatment and end-cap design, continuing the theme of improved aesthetics and performance. The 2019 Ninja ZX-6R features several ergonomic updates, as well as all-new styling. The rider triangle remains unchanged, utilizing Kawasaki’s Ninja supersport seat to pegs to bar orientation, which offers a naturally sporty riding position. A slim and flared fuel tank makes it easier for riders to grip the tank with their knees. The ergonomic updates include changes to the seat, front cowl, and windscreen, as well as an adjustable clutch lever. The new seat is shorter front-to-back for improved comfort and feedback from the chassis. It is also narrower in the front section to help facilitate the slim riding position and make it easier for riders to get their feet on the ground. An all-new front cowl and windscreen design blends show-stopping good looks with real world wind protection for sport riding while also maintaining visibility during more upright street riding. Complementing the adjustable front brake lever is a new adjustable clutch lever with five available positions. This allows riders to modify both hand lever positions to suit their hand size and preference.